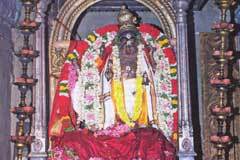 18 day Panguni Brammotsavam in March-April, with Saraba Utsav on the Sunday following the Brammotsavam is celebrated in the temple with Eka Dina (single day) Archana throughout the night. Lord comes in procession that day in His silver car. Fridays, Saturdays, Sundays, Ashtami (eighth day of new moon or full moon fortnights) are the days dedicated for special pujas to Lord Sarabeswara. Also daily Saraba Homa is conducted in the temple. Special pujas are performed for Lord Muruga on every Karthika star day. Sankatahara Chaturthi Puja is performed for Lord Vinayaka. Navarathri in September-October and Shivrathri in February-March are festival days. Also Poornima procession is celebrated each month. The devotee crowd will be huge on Pradosha days (13th day of full moon or new moon fortnights). 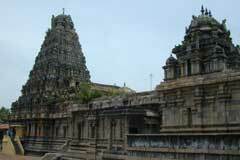 Also Tamil and English New Year days and Pongal are celebrated in the temple with special abisheks and Aaradhanas. 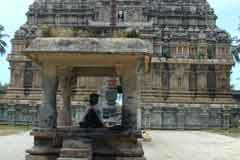 Lord Shiva in the temple is a swayambumurthi. Lord Sabeswara in His 7 feet tall majestic posture graces from a separate shrine. Sri Kambakareswarar Temple, Tirupuvanam-612 103, Thanjavur district. 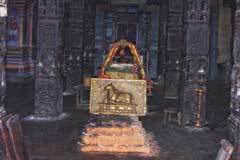 Shrines of Lords Bikshadana, Lingodhbava, Dakshinamurthy, Brahmma and Mother Durga are in the prakara. The temple under the administration of Darumapuram Aadheenam has nine Sacred Springs including Saraba Theertham. People pray to Lord Sarabeswara for relief from illness, worries, court matters, effects of witchcrafts, threats from hidden enemies, spells, adverse situations caused by planets. They will achieve a life of their choice, promotion in job, wise children, and freedom from debt burdens. Those praying to Lord Kambakareswarar are blessed with total relief from neurology problems, shivering, meaningless fear in mind, lack of brain growth and other ailments. They are also blessed with healthy longevity. Mother Ambica frees Her devotees from sin, ensures unity among couples and child boon. Devotees perform Sahasranama archanas (chanting 1000 names of Lord), sandal abishek, Saraba Yajnas to Lord Sarabeswara for 11 weeks continuously. They perform archanas with red flowers, fragrant leaves called Marikozhundu in Tamil, Vilwa, Nagalinga flowers and offer vastras. This is an important commitment. They also perform abishek with curd and milk for relief from ailments and longevity respectively. Generally abisheks are offered to Lord with oil, rudrabishekam, offering vastras to Lord and Mother, Annadhanan-feeding and nivedhanas for distribution to devotees. Lord Sarabesa has in Him the collective powers of 1) Lord Shiva, 2) Lord Vishnu, 3) Mother Pratyangaradevi and 4) Mother Durga (Sulini Durga). 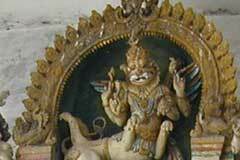 The blood of demon Hiranya stayed His body during the Narasimha Avatar which made Him very furious. To cool Him down, the Devas approached Lord Shiva. They were afraid of the birth million wicked souls if that demon blood fell on earth. As the blood was in the body of Mahavishnu with nectar in Him, these wicked souls, if born would become indestructible. Lord Shiva alone could offer a solution. Lord Shiva took a very strange form with Yazhi face, human body, eight legs, four hands and two wings. One wing was Mother Pratyangaradevi while the other was Mother Durga Sulini. He chased Narasimha into sky and space to a point where gravitation will not work. He pressed Narasimha with His nails to bring out the impure demon blood and get it evaporated there. Sooner the demon blood left His body, Lord Narasimha became soft and smiling and worshipped Lord Shiva. Thus worshipping Lord Sarabeswara brings the devotee the benefit of worshipping all four Gods. Lord is also known as Nadukkam Theertha Nayakan meaning that He saved the devotee from shivering or trembling for some reason or other. Mother is also known as Aram Valartha Nayaki meaning that she upholds Dharma for ever. 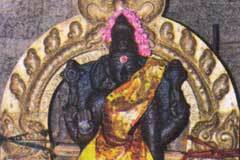 Agni, Mandhadha, Varaguna Pandian, Moon and Sun had worshipped Lord in this temple. Mother graces the devotees with Abhaya Mudra – ensuring protection with one hand and holding lotus flower and Akshamala in other hands in a standing posture. The peeta (dais) is called Odyanapeeta and Padma Peeta. 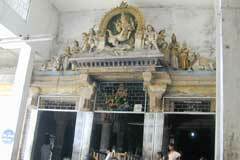 There are numerous paintings and sculptures in the temple depicting scenes from Ramayana and Mahabharatha. 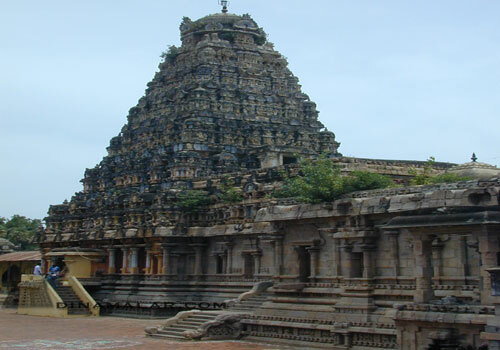 The temple is built by Kulothunga Chola III, grandson of Rajaraja Chola resembling Thanjavur Big Temple – popularly known as Thanjai Peria Koil. King Varaguna Pandian was proceeding on a war against his enemies. He was riding fast on the horse. As a Brahmin came crosswise, to save him, the king tried to reduce the speed. But, as fate had it, the Brahmin died of the accident. His spirit occupied the king with Brahammahati dosha-sin of murder. 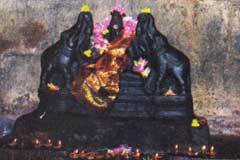 He came to Tiruvidaimarudur for worshipping the Lord, where the spirit left him and stood at the eastern entrance. He proceeded to Tirupuvanam and yet was trembling with the fear of the spirit catching Him again. Lord Kambakareswarar saved the king from trembling. Hence, He is praised as Nadukkam (trembling) Theertha Nayakan. 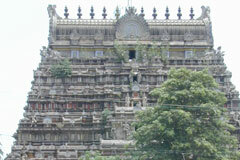 Tirupuvanam lies on the main Kumbakonam-Mayiladurai road and is linked with sufficient bus facilities. Bus facilities are available from Kumbakonam too.